Lemon and lime combine for a one-two detox punch. Throw in the cleansing properties of kale, a banana for creaminess and taste, and you’ve got yourself a delicious detox smoothie. Citrus fruits are well known for their detoxification properties, lemons and limes being no exception. 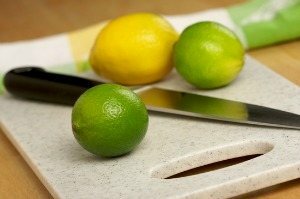 Lemons and limes both help to cleanse and detox the liver. Their high vitamin C content aids the liver in producing glutathione, The Mother of All Antioxidants. The citric acid in these fruits is also helpful in breaking down unwanted kidney stones. Aside from smoothies, a warm glass of water with lemon and/or lime juice first thing in the morning is a good way to clean out your system. Kale provides the body with fiber and chlorophyll, both of which support the body’s natural detoxification efforts. Fiber binds with toxins and other undesirables in your digestive tract and helps usher them out. Chlorophyll helps to remove heavy metals and other toxins from the body. In order to successfully detox you need to get the waste out. The lemon, lime, and kale also make this a very alkalizing smoothie. Enjoy! Load all these wonderful ingredients into your high speed blender and blend for around 30-45 seconds or until your desired consistency is reached. Please leave a comment below and share your thoughts on this Lemon-Lime-Kale Detox Green smoothie. Happy Blending! Hi Matthew, that depends on several things. How healthy are you to begin with, do you already consume smoothies regularly, do you have any underlying health conditions, what’s the rest of your diet look like, what does your typical day entail, etc? For most people, consuming a detox smoothie like this for breakfast is a good starting point. Then you could look at consuming another one for lunch, and possibly even dinner for a couple of days. I would advise switching up the smoothie recipes and incorporating a fat like coconut oil to ensure you get enough calories and energy if doing 3 smoothies a day. I just did a Minty Lime Detox Smoothie today (high in KCL), would it be safe to do this one tomorrow, or do I need to wait a day or two? I have been drinking the one I had today 1X/WK for 5 weeks. I like the addition of mint. To be on the ultra safe side I would wait a day, maybe have one M-W-F. This smoothie provides a fairly mild detox. Everyone’s body is different. Pay attention to how you feel, you may have no trouble consuming one a day, but ramp it up slowly. I’m not qualified or familiar with treating fatty liver. I would run a Google search and see what turns up. There’s bound to be foods, herbs, and spices that you can add into a smoothie. I would avoid all processed foods, sodas, sports drinks, junk foods, and trans-fats. Oh, thank goodness! A non-vomit-inducing recipe at last! LOL. Glad you like it, Louise. Is Kiwi fruit can be added also in this blend? Absolutely. Kiwi would be a nice addition to this recipe. You could zest the the lime or lemon (I’d only do so with organic varieties) and add that into your smoothie for additional nutrition. Wonderful delicious! Can we add papaya, avocado? Sure you can add papaya or avocado. You could substitute 1/2 avocado for the banana. Hi, is it ok to substitute a meal with this smoothie? Ex: I have a smoothie for breakfast, then have a meal for lunch and then have a smothie for dinner. Is it ok to do that? Just wondering. Good question. I recommend a smoothie for breakfast and two regular meals. However, occasionally substituting a smoothie for dinner and having two smoothies in one day is ok. I’d just be careful doing that all the time. Can you get the same effect if you omit the banana? Yes, Sanjia, you’ll get the same detox effects if you omit the banana. Ryan, I lost your email but found you back on here. I have a question–how often should you drink DETOX smoothies instead of regular healthy smoothies? Great question. I recommend one detox smoothie every couple of weeks. Once or twice a year you can consume detox smoothies for a week straight. That said, these detox smoothies won’t harm you if you consumed every day, they just aren’t as filling or tasty as the average smoothie. I think this is a good combination for detoxing, Missy. I recommend one detox smoothie every couple of weeks. Once or twice a year you can consume detox smoothies for a week straight. That said, these detox smoothies won’t harm you if you consumed every day, they just aren’t as filling or tasty as the average smoothie. Hi Ryan. I tried your detox smoothie. Yum! Better than I expected. I replaced the water with distilled aloe water. I didn’t have any blueberrries so I used rasberries. Very good. Thank you for your websight. I refer to it often. Distilled aloe water – nice! Raspberries, or any other berry, as equally as good as blueberries. Nice to hear you enjoyed this recipe and refer to my site often. I like to make smoothies along with ginger and kale and celery for afternoon snack because I want to increase my vegetables intake per day. Because it is also a detox smoothie, would it still be good to drink it once everyday? Yes, you can drink it every day, Lori. Just made this with my new toy (genie blender) its the first smoothie I’ve made an its fit 😁. Do you know any using beetroot? Told that’s really good for you! I accidentally bought spinach instead of kale. Will Ii still get the same detox? No exactly the same, but close enough, Mae. Is it the lemon and lime only that makes it detox? I’m on vacation. I brought both along with Triple Zero yogurt, raspberries, kale, coconut water and almond milk, plus frozen fruits, flax seed oil, and nuts. What combination makes smoothie detox? Hi! Love this smoothie! My mom was told she had a fatty liver and started using this and if is totally working. All her numbers are great! I have one question, would it be ok to add whey protein to the shake? Trying to make it more filling as a meal replacement. Sure you can add whey protein, Nadira. You might also add a little coconut oil and/or avocado to make it more filling. You do not, they’re 100% optional, Jessica. Yes, natural sugar from the fruit and honey or maple syrup. This isn’t meant to be a smoothie to have every day. I drink detox smoothies periodically.